What is Aiki? Introduction to a method of analyzing Aiki. Masaru Takahashi Sensei explores a method of analyzing Aiki. 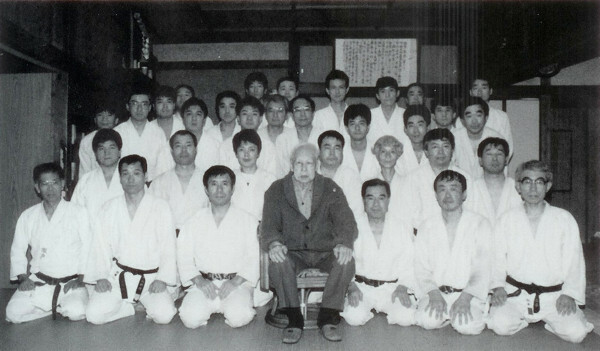 Masaru Takahashi (高橋賢) is one of the senior students of the famous Daito-ryu instructor Yukiyoshi Sagawa, who was a direct student of Sokaku Takeda and one of Aikido Founder Morihei Ueshiba’s seniors in the art of Daito-ryu. 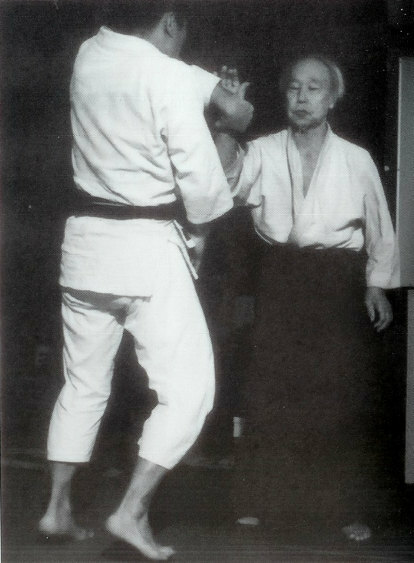 He entered Sagawa Dojo on May 5th of Showa year 47 (1972). He currently instructs at the Sagawa-den Daito-ryu Aiki Budo Sagamihara branch dojo (佐川伝大東流合氣武道相模原支部) and at the Daito-ryu Sagawa Dojo hombu (大東流佐川道場本部) in Kodaira city. Takahashi sensei has contributed a number of articles researching the Japanese martial arts and Daito-ryu to the monthly Japanese Budo magazine Hiden (月刊秘伝), published by BAB Japan (“BAB” stands for “Budo and Bujutsu”). This article is the first part of an excerpt from Takahashi sensei’s book “The Truth of Daito-ryu Aiki” (大東流合気の真実), which was published in Japanese by Fukushodo Co. Ltd. in September 2007. Through the principles of Aiki pacify and reconcile those threatening violence. Also when the enemy has already attacked, likewise transform and change according to the attack of the enemy through the principles of fitting together Ki and achieve reconciliation. This is somewhat abstract, but it states the fundamental principles of Aiki. However, it appears that the profusion of lofty and esoteric theories of Aiki in the world at large have puzzled those conducting investigations into Aiki. Sensei’s expert Aiki techniques were certainly not that way from the beginning. 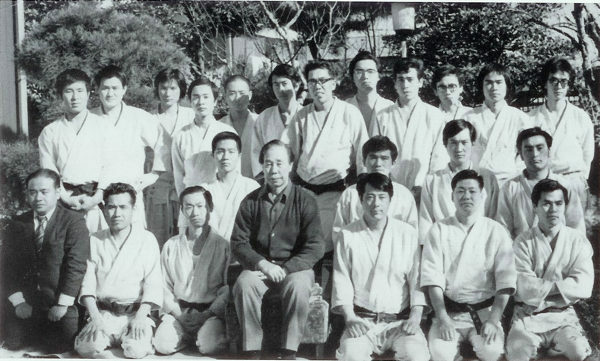 From Sensei’s discovery of the fundamental principles of Aiki when he was 17, through research into many basic techniques, through discovery, through a continuous aggregation of training, only then did his Aiki begin to develop into those expert techniques. 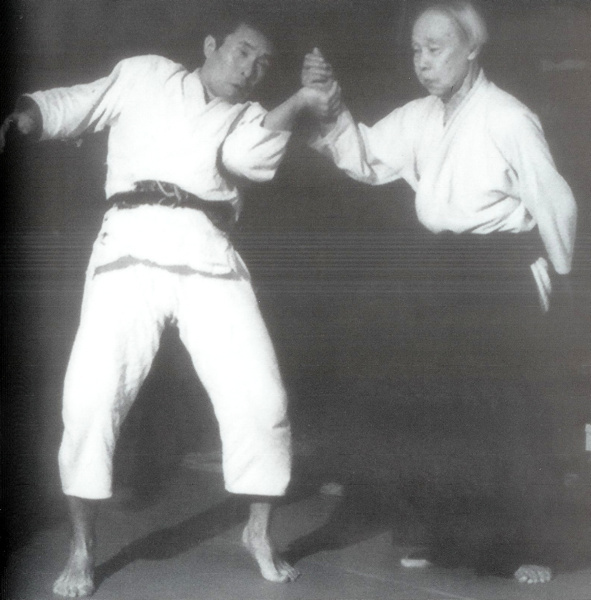 Even if you consider Sensei to be a genius, it actually took some sixty years from the age of 17 to the maturity of Aiki of the Body (体の合気) that was seen when he was 75. The fundamental principles of Aiki were discovered by Sensei when he was seventeen years old. I was never specifically told by Sensei what those fundamental principles are. However, hints were often contained in Sensei’s talks and in the technical methods of Aiki that we received in his teachings. The first of the fundamental principles of Aiki to be discovered were, of course, not of a high level, or greatly complex. They must certainly have been basic, and simple. We can make several conjectures about the first of the fundamental principles of Aiki. Among them is one that I think was the first of the fundamental principles of Aiki to be discovered. For this reason Aiki techniques, even though Sensei surely practiced them, are not a viable path. If you build your understanding beginning from simple fundamental principles it is certain that you will reach a clear understanding of Aiki. make public a method for the analysis of Aiki. I hope that this will be of benefit to those striving towards learning Aiki. 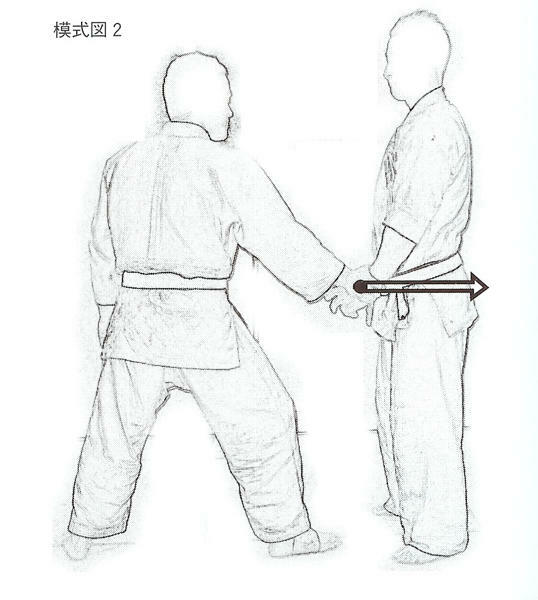 First, no matter how much I feel that I am pushing, no matter how strongly I feel that I am grabbing Sagawa sensei’s left wrist, Aiki is applied as in Figure 1, and I am thrown easily in Aiki-nage. Also when the enemy has already attacked, likewise transform and change according to the attack of the enemy through the principles of fitting together Ki and achieve reconciliation. In this Aiki-nage I am outdone in the usage of power by the more than ninety year old Sensei. There is absolutely no possibility that Sensei was possessed of greater power than myself. If we suppose that the aged Sensei’s power can be characterized as “50”, then the might of my body can be characterized as “100”. At the same time, the wrist is lifted back and upwards from the starting point. This is Figure 3. At this time the wrist is not resisting my power. 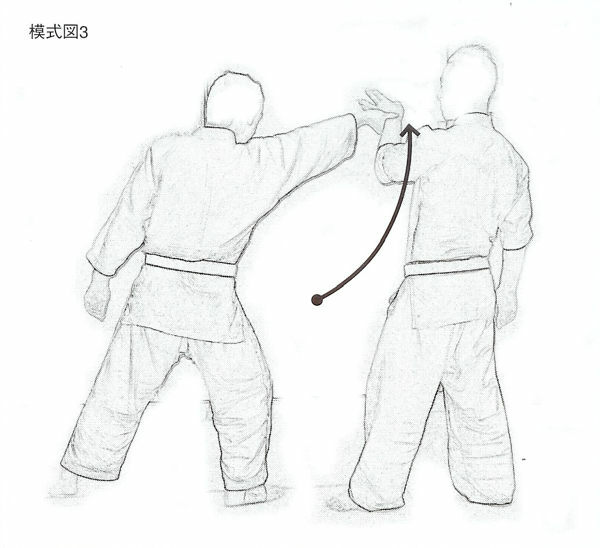 It has only “transformed according to the attack of the enemy” (敵の攻撃に随い転化), and the direction of the power of the enemy’s pushing attack is changed through a very slight manipulation of the wrist. Since there is no resistance to my power, the power of “100” is not necessary. Since it is just a change in the direction of the power, only a very small amount of power is necessary. Suppose that we characterize this very small amount of power as “5”. Sensei lures my posture forward and upward while deflecting my attacking power of “95” with his power of “5”, with no resistance to my pushing power. For that reason my posture is destabilized. At this point my arm is fully extended. If I do not step forward then my pushing power is limited to the range of my arm. My pushing power has been exhausted. While putting forth my pushing power of “100” my attacking power of “95” has vanished. It is almost completely exhausted. Sensei’s body is only acting enough to keep the remaining attacking power of “5” grasping his wrist. In the “Principles of Aiki Budo” this is: “achieve reconciliation” (融和致さす) – a condition in which “the power of the enemy is made into nothing, Aiki has been applied”. 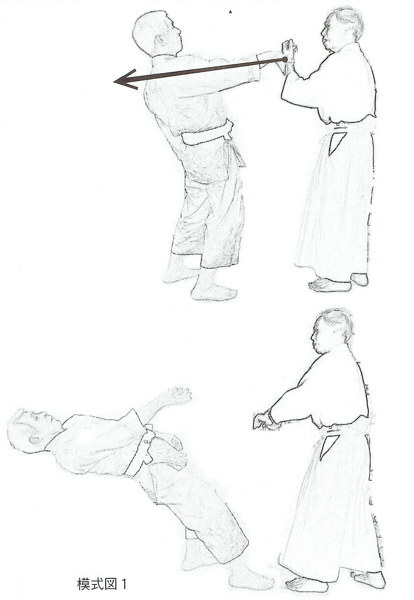 Up to this point is “the Aiki of Defense” (防御の合気). Here Sensei will shift to a counter-attack. Concentrating power in the left wrist, he faces his exertion towards me in a single breath and I am thrown in Aiki-nage as in Figure 1. Even with only a power of “50”, when concentrating power Sensei does not need to make use of all “50” of that power. I am destabilized, my pushing power has been exhausted, and only a the tiny amount of a power of “5” remains. For that reason, if he turns that power slightly upwards, then exerting a power of “7” or “8” at the most in a single moment will be enough. There is no need for an over-expenditure of power. 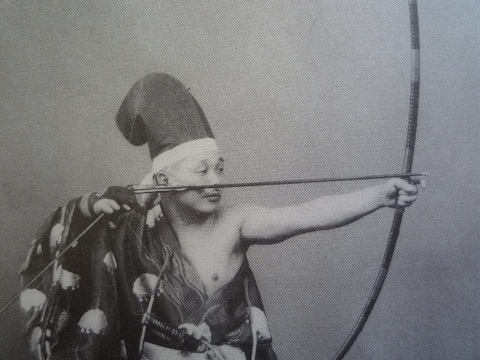 This is called the “Aiki of Offense” (攻撃の合気) or the “Concentrated Power of Aiki” (合気の集中力), and is the usage of a tiny amount of power with precision and effectiveness. 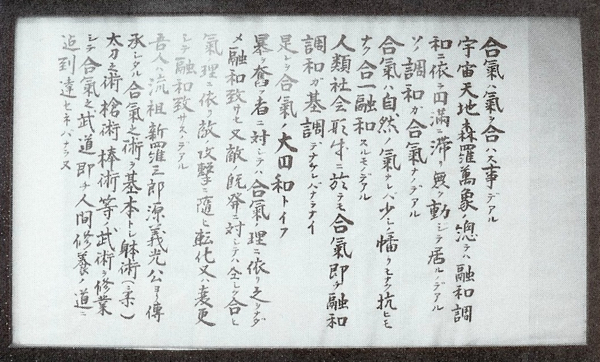 Later, when Sensei had further developed this he named it “Transparent Power” (透明な力). Considered in this light, Aiki can be said to be the “Economics of Power”. Sensei’s Aiki has been called a “miracle” by outsiders, but he himself often said “Aiki has logical principles, it is not a miracle”. Aiki is not built on esoteric theories, nor is it built on supernatural powers. It is appropriate if you think of it as based on “fundamental principles of mechanics” that can be sufficiently understood with a knowledge of high school physics. However, if you examine the technical method discussed above, in addition to mechanics there are a number of other fundamental principles that are being applied. Let’s break them down simply. Hey Chris. If this is ever published, I’d love to buy a translation. I think that it’s out of print, even in Japanese – but you never know! Thanks you so much for this translation! Very interesting. And very much in accordance what I experienced with other teachers like Nobuyuki Watanabe. He also says: No miracle. It is very easy. And there are principles, which are bodily based. A great piece, when will part 2 be published ? A (good) translation of the whole book would be nice but probably too much to hope for. Thank you so much! This is important to the continuation of Aikido and to other internal arts. Glad that you enjoyed it Chris (with a name like that you can’t go wrong!). Thanks Jose, I’m glad that you enjoyed it! I really enjoyed reading this. This is what ki is all about.